While at CHA Winter last January I was thrilled to see fabric lines from a few scrapbook companies. I LOVE that fabric is sneaking its way back into scrapbooking and paper crafting. But, being the “non-sewer” that I am (I have only touched my Brother once in the last 2 years), I wasn’t sure how to incorporate this adorable new trend into my layouts and projects. Enter Prima Marketing Inc. When I saw their embroidered canvas tags and fabric shapes I was ecstatic! Prima’s fabric embellies are totally easy and ready to use. They’re beautifully embroidered, and seem sturdy and durable. As far as usefulness goes they probably don’t rank up there with basic brads or buttons, but if you need a gift idea, are making a home décor item, or would like a unique journaling option for a page these work great. As far as cost goes you’ll definitely get more bang for your buck buying paper journaling tags, but again, if you need something special they’re worth the extra cost. 1. I found that using acid-free liquid craft glue worked best for adhering items to the fabric, or adhering the fabric to pages/cards. 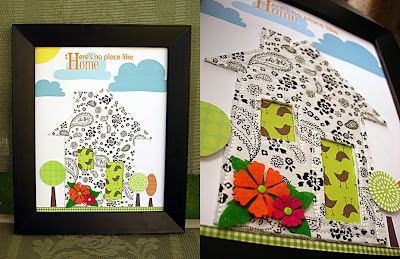 Have you tried using Prima’s canvas and fabric embellies? What do you think about them? 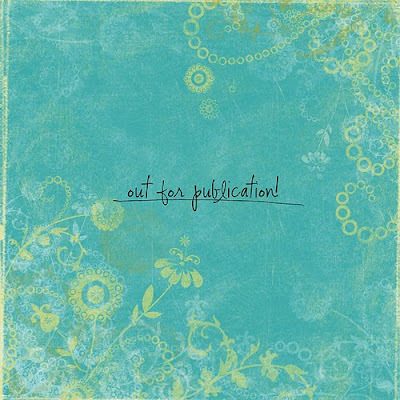 Do you use fabric in your scrapbooking or paper crafting? What’s your favorite way to use it? I have not used fabric in my layouts. I don't know why I never thought about it since I was an avid quilter long before I was a scrap booker! These tags are something I will be looking for at my local scrap book stores because I like the texture of the fabric and see myself using them. I am especially fond of the journalling tag. I have an embroidery machine and I could probably even embroider my journaling on it. The cost isn't really much different for what I spend on many other embellishments. Wow, I hadn't seen those before. I really like the look of them. 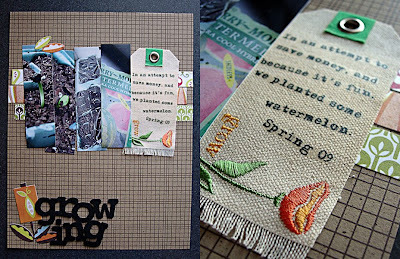 I have used fabric a little in my scrapbooks before and I think it would be great to use that grow tag on pictures I took of us putting in a garden (like your beautiful page). Thank you for telling us about them and especially how to adhere them. Very cool!! love the texture. i'm with you, I can only sew in a straight line, so pre-made stuff works great for me. I think I can make them-but when it's all said and done, I doubt they would end up being any cheaper. I would have to buy canvas, etc. not to mention time and frustration. Love these! I'll definitely consider using fabric more often my layouts--thanks for another great review! I don't use fabric much on my layouts. Only a couple times that I recall. I have used fabric to make yo-yo's for flower centers. Those turn out really cute. These products are cute. Don't know if I'd buy them unless I had something specific in mind, though. These are very cute, but they are indeed on the pricey side! I guess all the talented sewers/quilters could probably make these one their own. Thanks for the review and the tips! I love using fabric in my memory books and other crafting projects. I just need to be more diligent in purchasing more material. I have been eyeing these! Thanks for the review. I'm on such a tight budget that I probably won't pay that much for embellies. I love using fabric on my pages and LOVE these tags!!! Some of the ways I adhere fabric is with Terrifically Tacky tape (or equivalent), stapling, stitching, or by ironing fusible web to the back. Then you can iron it onto you page or project. It works great! These are beautiful - always nice to see what's new out there and learn how to use it through someone else's experience. Love what you did with yours! They are very cute but we don't have them here yet. My only complaint would also be the price they are for one embellishment. Great projects! I would really like to see the rest of your tags album. Will you please post the entire album on your blog or in one of your galleries? Thanks for the ideas and inspiration! You did a wonderful job on your projects. This is one of things, I don't care the price I must have it!!!!! (don't tell my DH that!) I do wish they were a bit cheaper. It just makes me want to recreate my own after I get the inspiration. very cute but I have not seen these before or used fabric. I use fabric in my layouts occasionally. My favorite techniques are Velvet embossing with rubber stamps and atamping words on twill "ribbons". I love the canvas tags!!! The price is not enough of a drawback to keep me from buying them!! They look really cute and what a great idea to use the Avery iron on with them. I have not used fabric in my scrapbooking but I am looking forward to getting my hands on some of Prima's new stuff. I love what Donna Downey does with fabric and want to give it a try! Ok, I love those canvas tags! I need them pretty bad. I'm not gonna lie!